iVillage conversation about special needs children. 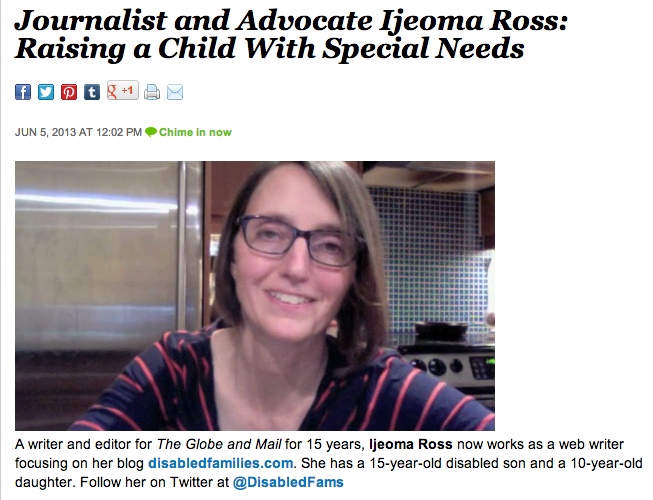 This week I am participating in a conversation on iVillage.ca about raising special needs children. The chat is hosted by noted pregnancy author Ann Douglas and includes blogger Lisa Thornbury and writer Catrina Carefoot. We cover the joys, sorrows and challenges of raising special needs kids. Check it out. iVillage comments about support networks and the joy of laughter. This evening Lisa, Catrina and I will be in a Google Hangout about special needs children. Tune in at iVillage at 9:00 pm ET. I LOVED THIS!!! And posted on our Parent Voices Facebook page.